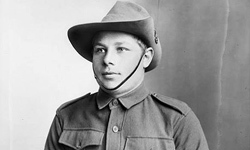 In a story in the Guardian, the remains of Harry Willis, an Australian voluteer, was found and identified in the first mass grave discovered in 80 years. The grave, in Frommeles in northern France, held over 250 other bodies as well. They were killed in an attack on the German lines in Lille, and it was Harry's first day in Combat. Over 5,500 Australians were killed in the attack, described as the country's worst day. Harry was a Lewis gunner.